Note: This budget might have +/- 3~5% variant by the time of departure, if we have a new update, we will make known through website and newsletter. This fund is for the on-going living cost in Japan. It is different than the one-time fund. Just like a church need its member to give regularly, missionary also need Christian and churches to support regularly, so we can continue to serve the Lord and build up His church in an unchurch location in Japan. This budget may seem quite high, but when we carefully study how the fund is used, we find it is reasonable. This budget was based on Worldventure 74 years' of mission experience, and we trust that they do know how to take care of the missionary family, so we are able to serve the Lord long-term in a mission field. Compare with a regular pastor who serves in the US, the income, benefit, retirement, and ministry expenses, I think it is not far-off. Salary (24%): This is the regular income, which includes our utility and living expenses. ORC (10%): Inflation adjustment factor. Tax (11%): We have dual status, Self-employed and employee, it is a bit complex. Shelter fund (7%): Since our mission agency has a well-established history in Japan, they are able to make a good deal with lower than normal rental housing. Insurance and evacuation insurance (13%): Although Japan provides public health care, the missionary has dual status, so we need to maintain insurance in the USA. This fund including general health insurance, disability insurance, life insurance, evacuation insurance, in cases of war or disaster. Children education fund (6%): This fund is for regular monthly children education need. Ministry fund (10%): This is for general ministry need. Agency operation (14%): This fund is for head office operation fee. Home assignment fund (1%): Every 3~4 years we need to return to the US for home assignment, so we can continue to maintain the relationship with partners and churches, also attending training etc. 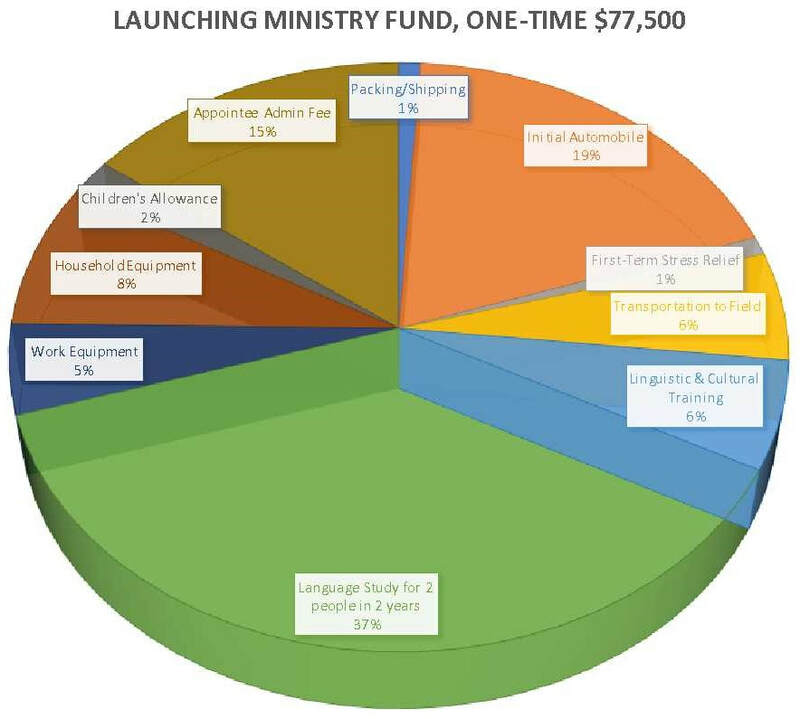 This fund is for our first term ministry need (Each term is four years). In other words, this fund will be used within four years. We only need to raise this fund once. After we used this fund, we no longer need to raise this fund again, unless we have a special project in the future. Why do we need this fund? When we move to a new place, we need to setup new home and office. Our home will also be used for ministry purposes, such as small-group, or the new church at the beginning stage. Many of the household equipment will be used for ministry need. Transportation (19%): This fund is a reserve for buying vehicle in the country. First-term stress relief (1%): This fund allows us to take a break during the first-term of transition. Transportation to field (6%): Tickets for the whole family from the US to Japan. Cross-cultural training (6%): This training is very important to prepare missionary for cross-culture ministry. Since I have learned some Japanese, we do not need to take the language adaptation training, we only need to do culture adaption training, this allows us to raise less fund for this category. Language Study (37%): This language learning will begin when we move to Japan. This fund is for both Gary and Jennifer 2 years full-time tuition fee. Work equipment (5%): office equipment such as printers, computers, etc., for use in ministry. House hold equipment (8%): This is for the purchase of furniture, appliances, household goods. Our residence will likely be used as a place for small groups, and even early stage of a church. Children Allowance (2%): Moving and changing environment is a big challenge for kids, this fund allows us to setup a suitable environment for kids and helps them transition well. Appointee admin fee (15%): The fund is for administration fee for the mission agency before we leave for Japan. Mission agency provides us support, such as training, missionary care, supervision etc.